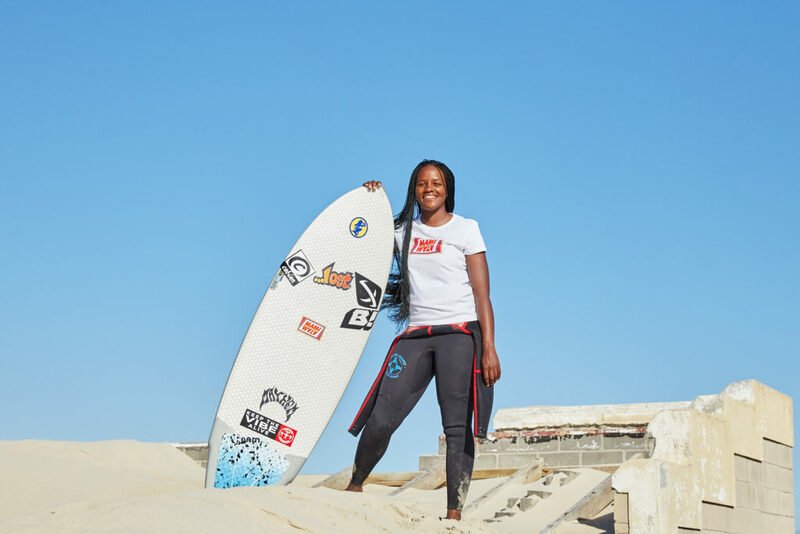 In a unique collaboration Mami Wata, a brand that embodies the spirit of African surfing, and Waves for Change, an award-winning African surf therapy programme, have come together to empower the next generation of African surfers. In a partnership that is already making waves, Mami Wata have provided all Waves for Change (W4C) coaches with branded kit for the upcoming season. The coaches, who sit at the heart of W4C, are members of township communities across South Africa. These young leaders combine a passion for surfing with an aspiration to help young people in their communities to make positive life choices. Recognising that the coaches are the future of African surf, Mami Wata is dedicated to support their growth and development where possible. Apart from dressing them in Mami Wata’s distinctive Mfazazana board shorts, t-shirts and caps, one coach has already begun work at the newly open Mami Wata store in Bo Kaap, Cape Town, and one has been selected to model in Mami Wata’s marketing campaigns. With more opportunities being lined up for Waves for Change coaches in the Mami Wata business. In addition, Mami Wata appointed Waves for Change as the beneficiary of their ‘Night of African Surf adventure’ event run on December 6th in association with Wavescape. Prints of the recently run #surfafrica photo competition were auctioned and all proceeds from the night donated to the programme, and more public fundraising opportunities lining up. “This is very much our first wave, and we’re planning to much more with Waves for Change in the future.” Said Mami Wata’s Chief Surf Officer, Andy Davis. “The work they do is truly exciting and inspirational, not just sharing the joy of surfing with disadvantaged communities all over Africa, but also using surfing to alleviate suffering, spread good vibes and reinforce positive life choices. You don’t get more feel good than that! Waves for Change are the undisputed world leaders in surf therapy, and a powerful symbol of African excellence, which is a concept at the very heart of what we do at Mami Wata. We’re just stoked for the opportunity to be involved and lending a hand!